Nowadays no specialist or business organisation (related to the environment) can ignore the importance of GIS opportunities for the professional process planning, management and monitoring of the implementation of activities. In the near future GIS capabilities for systems and its’ influence will only grow: improving hardware tools, thus in particular increasing the accumulated and acquired spatial data volumes and their quality. Professionals and workers with no knowledge of GIS and the available data application possibilities will not be competitive in labour market. Therefore this Project aims to increase job opportunities and work force mobility, to develop new GIS competencies matching labour market needs in the region and to improve Joint GI education services and training available. Specialists with better skills working in the Programme region, will increase its’ competitiveness. Employable people will see the region as an attractive place for working and settling down. Project produced these outputs so far: trainers (lecturers) increased their qualification with up to date GI knowledge, two improved GI competencies centers for joint use were created in the region and opened for public use. Students have participated in the GIS training in spring semester. In autumn – GIS training will continue to take place in Klaipeda and Jelgava GIS competencies centers. Altogether around two hundred trainees will participate in joint training during the project. Students, employees, business organisations and also local community will benefit greatly from this project. This project is cross- border, as it is cost effective and most effective way. Implementing a project with transnational partners will help to obtain reliable results, share good experience, thus it will help to spread the information about the project‘s outcomes widely. Learning what is needed in both countries will enable students to get the best experience and will allow them to become more employable. For Joint training training workshops and seminars will be organized in the participating organisations. Project outcomes will connect people in the region for common training and research purposes. On the 14th of February, at Klaipėda State University of Applied Sciences, Faculty of Technologies, project’s GISEDU conference was held, during which the purchased equipment and its possibilities were presented. Project “Creation of Joint GI Education to Increase Job Opportunities in the region (GISEDU, Nr. 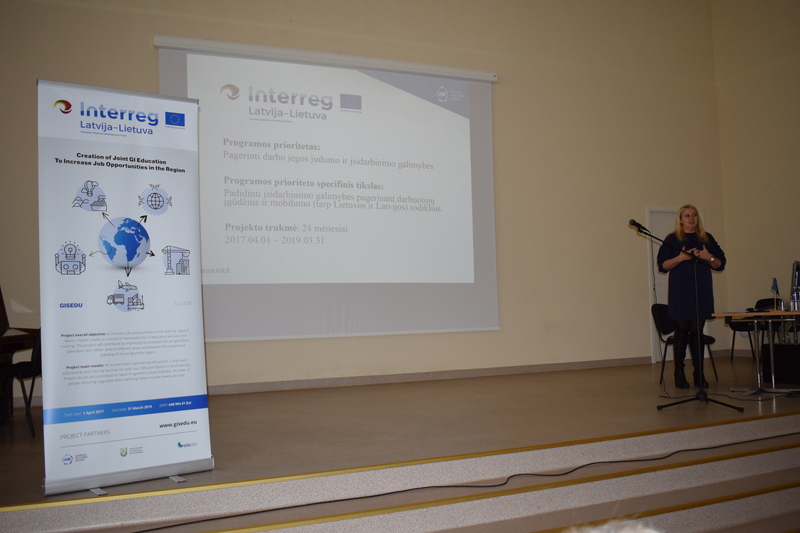 LLI-206)”, funded by Interreg V-A Latvia – Lithuania Programme 2014-2020, has been particularly important for the academic community and enterprises in the region for the last two years. Also, the municipalities of Klaipėda, Tauragė, Šilalė, Kretinga, Neringa and Palanga were introduced to the project activities, which in the future will benefit from GIS innovations in planning and better management of their districts and cities. The above-mentioned EU program finances and develops cooperation between the state borders, therefore Latvian University of Life Sciences and Technology (LLU) has been chosen as a partner. GISEDU project and its results were also presented to the representatives of the municipalities of Zemgale, Kurzeme and Latgale in Latvia. European Union has allocated 648 000 Euros for this project. For this amount, 2 GIS competence centers were established in Klaipėda and Jelgava. Also many up-to-date modern computer hardware (such as workstations-computers, multifunctional and wide-format and 3D printers) and some of the next generation software packages (Arcgis, Bentley Microstation, etc.) were purchased. The students and managers of geodetic companies have been attracted by a huge unmanned aircraft that can scan and digitize large areas within minutes, and transfer data to computer storage to recreate 3D images of areas with incredible small details such as grass clogs or pavement blocks. The project funded purchases of laser scanners, which can scan the environment or a specific building at speeds of up to 20,000 to 40,000 points per second. This state-of-the-art equipment creates a ‘cloud of points’ that penetrates even through plant foliage and measures not only the area, but also the facades (walls, windows, doors, etc.) of the houses behind the trees, within a few centimeters of accuracy. For comparison, it is enough to say that Lithuanian geodesy companies are still working in a classical – manual way, where people with available measuring equipment can record only individual points of the object and spend much more working time. GISEDU project also included teachers training. More than 50 teachers from the Klaipėda State University of Applied Sciences and Latvian partner had the opportunity to acquire competencies for working with intelligent systems innovations. 40 study subjects were renewed for new technological challenges. Expert, responsible for the technical part of the project, Indrius Kuklys, told about the experimental works carried out: 120 sculptures of Klaipėda Sculpture Park were scanned and digitized; the results can be seen on the website www.regia.lt. Practical work has also been carried out in the city of Šilalė, where D. Poškos Baubliai Museum and the park nearby were digitized. These tests indicate the infinite possibilities of the latest geodetic equipment and wide application not only in cartography, construction sector or other kind of business, but also in public life, promoting tourism and cultural objects. The conference was attended not only by the teachers and students of Klaipėda State University of Applied Sciences but also by representatives of various companies and organizations. We also had invited guests to shared their experiences. Head of Geodesy and GIS Division of Klaipėda City Municipality specialist Marija Buivydienė, Palanga City Municipal Architecture and Territorial Planning GIS Analyst Mindaugas Valaitis and Klaipeda University Researchers – dr. Eduardas Spiriajevas and Viačeslav Jurkin delivered presentations on the various ways and innovations of modern mapping technologies. The equipment, purchased with the funds of the project, is the most modern in Lithuania today and no other higher school has such an equipment. We are pleased that we can contribute to geodesy innovations, collaborate with various companies and create an attractive learning environment. More about the project can be found at www.gisedu.eu. This publication has been produced with the financial assistance of the European Union. The contents of this publication are the sole responsibility of Klaipeda State University of Applied Sciences and can under no circumstances be regarded as reflecting the position of the European Union. 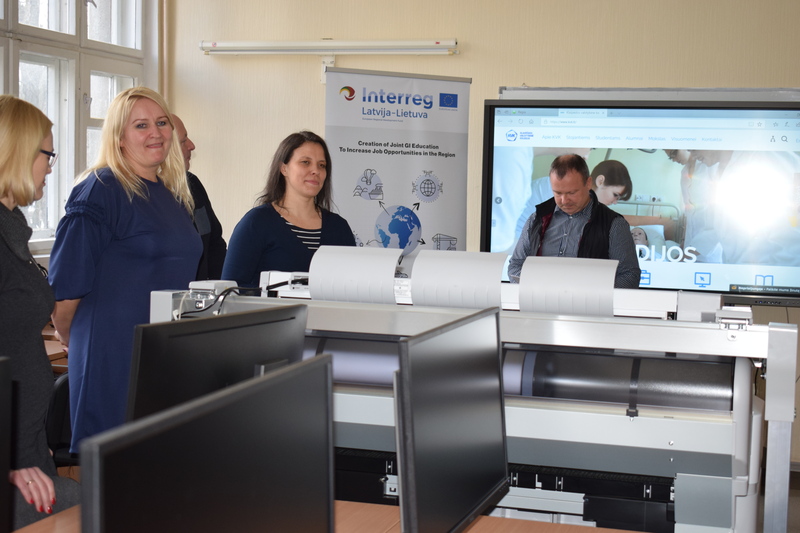 Objective, tasks and results of Interreg Latvia-Lithuania Cross Border Cooperation Program Project LLI-206 “Creation of Joint GI Education to Increase Job Opportunities in the Region”. Improvement of study programs in study courses emphasizing the topic of geospatial information. Geospatial basic data – the creation of a homogeneous data base. Use of geospatial information in water quality and quantity studies. Possibilities for GIS use in landscape architecture and planning. 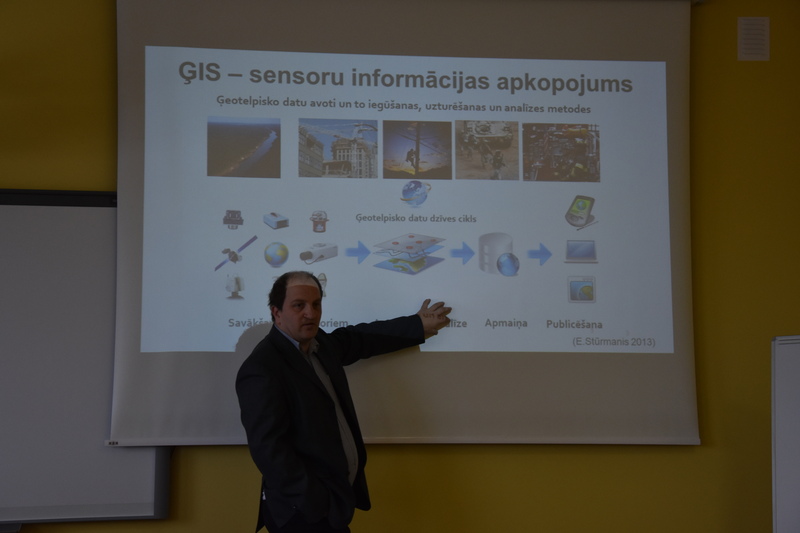 Application of Geospatial Information System in the Work of Jelgava City Municipality. GIS – a learning space for anyone. Presenters were from Latvia University of Life sciences and Technologies, Latvian Geospatial Information Agency, Latvian Society of Surveyors, Jelgava Municipality Operational Information Center and from Riga Technical University. GISEDU project’s local event ‘Distance Measurement Technologies and GIS’ took place on 27 September in Klaipeda State University of Applied Sciences. Not only KVK lecturers have participated in this event, but also representatives from Kaunas Technology University and Ernestas Galvanauskas vocational education center. We were very pleased to meet so many Klaipeda City Council representatives from Geodesy and GIS, Land planning, Apartments and Energy departments. During the event project interrim results were presented, purchased GIS equipment demonstrated. How education can respond to labour market needs, and future co-operation possibilities discussed. On 20 March 2018 Klaipeda State University of Applied Sciences hosted GISEDU (LLI-206) project‘s dissemination event: ‘GIS Opportunities and Challenges in Business, Higher Education and Public Sector’. Project was presented to students, academics, SME‘s and Klaipeda council representatives. Project aim, objectives, results; benefits of cross-border cooperation and project’s importance to the region were presented. Four speakers (VĮ Registrų centras, Klaipėdos miesto savivaldybės administracija, UAB Hnit Baltic, Klaipėdos universitetas) presented their experience using GIS in different areas and described the unlimited possibilities nowadays. Examples of created products with GIS were demonstrated. Thus new GIS Competences Centre in Klaipeda was officially opened. First group of students will be trained here in April. 2nd Project Partners’ meeting took place on 6-8 December, 2017 in Latvia. Latvia Agriculture University was hosting this meeting. The highlights of the meeting were: summarising 1st project period and its results, discussing Public procurement issues, reviewing both Period 0 and Period 1 reports, overview of Work Packages: Communication, Investment and Implementation. Business company (specialising in GIS) was visited. Both Project Partners agreed that the Meeting was great success because important decisions were made regarding Work Package 2 implementation and organization of joint GIS training. Article about GISEDU (LLI-206) project was published in newspaper “Vakarų ekspresas” on 26 September 2017.